Already a skydiver? – why not pay us a visit? 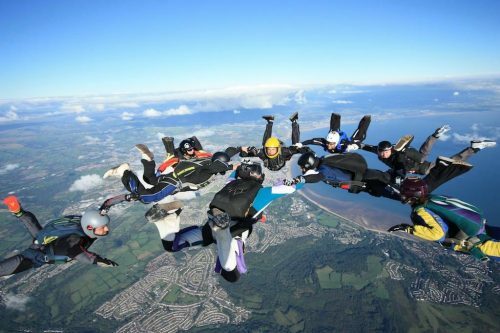 Skydive Swansea welcomes visiting jumpers. We ask you arrive early if possible 8am to allow for kit/ docs checks and a DZ brief. Please Note: The airport has 2 separate parachute landing areas. The Northern area is unrestricted and is suitable for all experience levels. The Southern area is restricted and you will need to have an A licence and have completed 5 successful pre declared landings to be able to jump on this PLA. The PLA in use is determined by the wind direction on the day of jumping and can often vary from lift to lift. Our club may be small, but our DZ offers some of the best views in the whole of the UK. We have a number of BPA coaches and instructors who can provide you with FS/ FF coaching/ general progression briefs, packing courses etc. See below for more information. The airport cafe is closed at the moment and a Burger van is normally on site for weekends. We recommend you join our closed Facebook Group where you will find a pinned post at the top of the page with the latest information on. Please note if you are viewing the Facebook group on a mobile phone you will have to click on ‘View pinned post’ to be able to read it. We always advise people to check the pinned post before coming to jump with us in case we have updated if open/closed/last lift going up soon etc. After this day you will then be required to pack a further 25 which are supervised by one of our packers. During these you will be introduced to twists, step-through and entanglements. Your 26th pack will be your packing test, and if successful, you will be presented with your packing certificate. Check our Facebook closed group for details of packing course days coming up. Contact us for costs. Check our Facebook closed group for updates on A and B licence briefing sessions. Contact us for costs. 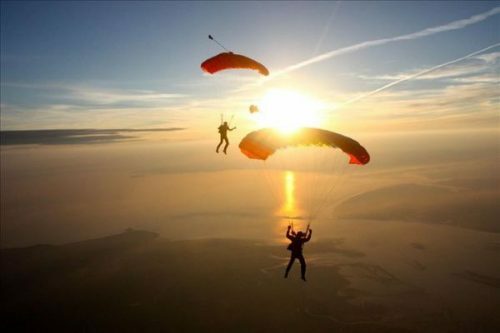 Skydive Swansea has a number of BPA qualified coaches who are able to provide you with structured coaching sessions to develop your skydive skills in a number of disciplines. A typical coached jump will consist of a period of ground based instruction/ briefing to prepare you for the specific goals of the jump; the jump itself (with in-air video), followed by a thorough debriefing (using video) after the jump has been completed. Coached jump costs are £27 for the coach’s slot plus your jump cost plus kit hire and packing if required. Example cost £66 which includes kit hire and packing. A coaching fee of £10 (paid directly to the coach). Formation Skydiving (FS) coaching allows you to refine, improve and learn new skills in belly flying. You will become a better, more confident and comfortable skydiver, while at the same time learning the most important lesson in skydiving – how to stay safe. The coaching will follow the British Parachute Association’s recommended FS progression program, teaching you the basics needed to be able to fly with your friends and in bigger groups. After successfully learning the skills, your final jump will be the FS1 qualifying 4-way skydive. In this jump you will aim to achieve four or more ‘points’ to gain the FS1 sticker, which allows you to then jump with other skydivers. Everyone who wants to jump with other people. Once you have completed your AFF and been awarded your “A” licence, doing solo after solo jump while others are jumping with their friends can get frustrating. This is the perfect time to start your FS coaching. Through learning more FS skills, you will soon be joining the others on those group skydives you’ve enviously been watching. Everyone who wants to improve. Maybe you’ve been out of the sport for some time, or simply feel your FS skills are a little rusty. Maybe you are sick of crashing through the formation, or not being able to reach it. FS coaching will teach you more advanced flying techniques and skills to help ensure you are part of the formation every time. The FS1 sticker shows that you’ve got the skills to skydive safely with others. Controlled forward and backward flying. Controlled turns – 90°, 180° and 360°. Swoop to pin – diving down to a formation from a delayed exit. Safe tracking away from a formation. The ‘graduation’ 4-way FS1 skydive. Formation Skydiving coaching is available from Tanya Quigley, Sophie Rees & Kris Wojciechowski. FS1 Skydive costs £85 plus kit hire and packing if required. Freeflying is an expansion of skydiving which extends into vertical flight where the flyer is in an upright position (falling feet first) or in an inverted position (falling head first). These positions increase freefall speeds and make new types of formations and routines possible. Once you’ve mastered the basic “belly flying” skills, Freefly coaching allows you to expand your abilities and fully understand the aerodynamic power of your body in freefall. Freeflying can, and usually does, involve constant transitions in position and speeds, with vertical and horizontal orientations. Our coaches are able to offer you “head-up” coaching whilst you work towards your FF1 qualification, as well as the more advanced “head-down” coaching as you work towards your FF2 qualification. Freefly coaching is available from Mikey Phillips. Tanya has almost 2000 jumps. She completed her AFF at Skydive Swansea in 2010, going on to fly camera by 2013 & gained her aff instructors rating in 2015. Tanya loves all aspects of the sport but belly flying is her forte. She can also provide coaching all the way through from your A licence to your FS1 and even afterwards if you’re feeling a bit rusty or want to refine your flying. If you want to do some coaching with Tanya feel free to contact her on Facebook (Teej Quigley) or get a hold of her at the DZ. Mikey Phillips has over 1400 jumps, and over 20 hours of wind tunnel flying time. He has travelled all over the world in his pursuit of freeflying and has jumped with a number of freefly world champions. As part of his own ongoing learning and development, Mikey is regularly coached by Matt Hill (current freefly world champion with French team Kristal) and also by Travis Fienhage (former world champion with SoCal Converge). Mikey can provide coaching in all aspects of freeflying, from the basics through to your FF1 and FF2 as well as load organising. Kris Wojciechowski has over 600 skydives and over 30 hours of wind tunnel flying time. He was member of the Airkix sponsored, 4-way formation skydiving team ‘4mula’. With 4mula he won gold at the 2011 British National Championships in the Rookie category, gold at the 2012 National Championships in the ‘A’ category and silver representing GB with 4mula at the 2012 European Skydiving League. In his time training with 4mula, each season he flew one hour or more of tunnel time a month and had several intensive DZ jump-camps, where he was coached by multiple world champion, Claire “Sparky” Scott. Sophie’s passion is formation skydiving. From her first few jumps Sophie knew she wanted to train hard to become a coach. Her love of belly flying has driven her to become a coach where she can share in student’s first time jump experiences while indulging in her passion for flying, teaching and filming. Whether you are looking to get your FS1 or to refine your techniques, Sophie can help you achieve your goals. Sophie’s coaching style reflects her love of skydiving and sharing of knowledge. Ricky Davies is a BPA qualified advanced packer and parachute rigger. He offers a full range of rigging services from initial assembly, reserve repacks, canopy relines, canopy patching, harness alterations and so on. Please contact the centre for further details or for a quotation on work you wish to be carried out. 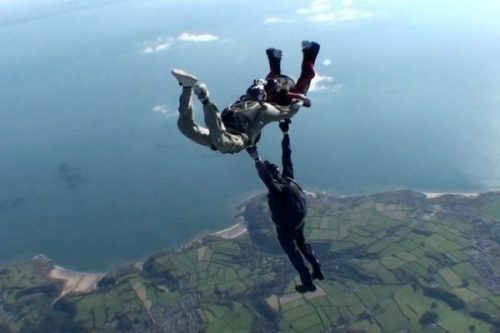 Again, other work can be quoted on request, please email us at info@skydiveswansea.com for more information.